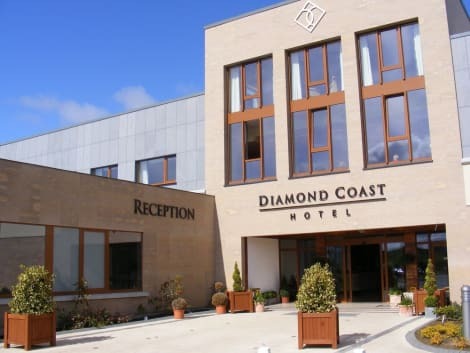 Located in Enniscrone, Diamond Coast Hotel is in the suburbs, within a 15-minute walk of Enniscrone Golf Club and Enniscrone Beach. This 4-star hotel is 7.1 mi (11.4 km) from Tom Ruane Park and 7.6 mi (12.3 km) from St. Muredach's Cathedral. A beautiful seaside town on Ireland's Sligo coastline, Enniscone attracts visitors to its scenic coasts from far and wide. The 5km stretch of beach, which offers striking views out to sea, is crowned in the evening with marvellous sunsets – ensuring Enniscrone hotels remain full throughout summer. With its wide, sandy shores capped by rolling green dunes, visiting Enniscrone Beach is the town's most popular activity. Brave surfers can catch waves further out to sea, while children can paddle in the shallow waters and adults can admire the coastal scenery. As a blue flag beach, it's one of the cleanest and safest on Ireland's Wild Atlantic Way. Kids will enjoy exploring the ‘Valley of Diamonds' – the volcano-like compositions of long-grassed sand dunes, while adults can admire the spectacular views from the top. Budding surfers can take a lesson at the 7th Wave Surf School or the North West Surf School. However, if Atlantic temperatures don't take your fancy, another popular option is horseback riding along the beach while enjoying the sight of miles of coastline. With access to some of the country's freshest sea life, you can also take a fishing trip along the eastern shore of Killala Bay or try some river and lake angling. One of the more unusual activities Enniscrone offers is a visit to its famous Seaweed Baths on Cliff Road. Here, water is pumped straight from the unpolluted Atlantic shore and visitors can enjoy a steam or seaweed bath or a seawater shower. For those that like less sedentary pursuits, a visit to the 14th-century O'Dowd Castle, the ruin of Valentines Abbey or the Castle Firbis Ruin all offer plenty to see. Enniscrone boasts a number of restaurants, bars and cafés as well as places to enjoy live music. The stylish Dunes Restaurants offers fine dining with striking views out to Killala Bay, while the Waterfront House Restaurant is also a popular choice for dining with a view. Afterwards, you can stop by a traditional pub, like the Áit Eile, and enjoy some of Ireland's famed hospitality. With a range of bars and pubs to choose from, if you're lucky you may even stumble upon a traditional Irish ceili.